IGHT IN SANSKRIT IS JYOTI— “THAT WHICH SHINES.” Light manifests on various levels, from the utmost, supreme Light—subtlest, absolute, invisible, that which you can only Be—to the most gross form. From the glowworm, as you go higher and higher, light becomes more intense and powerful, like the lightning that can destroy but is normally benevolent. Above that is the light of the sun, supernovas and quasars, etc. The sun you cannot look at directly; it is so powerful, its radiation will blind you. To us the sun is life-giving; we worship it as the Sun Deva, an exalted state, yet even the sun’s light is physical, gross. In the physical sense, Light comes into our eyes; that is why they are called “windows of the Soul.” But this is only a tiny manifestation of Light; the physical apparatus of the eyes can hold only so much light or they will become blind. The creation has to balance. The physical body can hold only so much wisdom, so much occultism. If the Prophets, Enlightened Beings and Sages would radiate more Divine Light than they do, the body could not hold it; it would just explode or disintegrate. Yogis know that they can only project so much at their will. Ordinary people, whom we call ignorant, by contrast generally use their will instinctively, which manifests as imbalance and disharmony to the point beyond which, if they push themselves, will cause nervous breakdowns or other difficulties. E ARE FULL OF LIGHT. Our bodies cannot express the full impact of this, our bones and flesh and blood simply cannot hold it. When darkness increases in our bodies we become heavy, depressed, miserable, diseased; when Light becomes too much, our bodies also shatter. For this reason there is a self-contained mechanism within us to hold on to that part of the Light by which the body is sustained. When the body is not sustained, the Light is fading; in Yogic terms we say the pranas have become weak. Then the senses begin to lose their sense gratification, the blood does not course back youthfully, the nervous system becomes weakened. In Sanskrit this is called Shitheel, when the Light fades. In ancient Vedic times the Aryans, which in Sanskrit means “noble or civilized ones,” were worshippers of fire. Long before other Devas and Devis1 were recognized, the Fire Deva was considered the giver of prana or life. Prana is a higher Light than even the sun or moon, which fade before the Light of prana, jivan shakti. Prana gives us Light—to our eyes, our ears, our entire body. By that Light we live; with that Light we see the darkness, we speak, we exist. When prana becomes weak, it wants to be “fed” by further enkindling of that Light. Prana comes from Spirit, the nucleus of Light, which is beyond what we can see or feel. That inherent, intrinsic, fundamental, basic Light is the Substance; it is not objective or tangible. You can only indicate that Light—Jyotish, Jyotish Bhava—or merge into It and be fully Enlightened. Light is everywhere, even in the darkness where we cannot see. Sunlight, moonlight, firelight, candlelight—all are lower manifestations or vibrations of the Ultimate Light. Absolute Light—which has been called Chit Jyoti, “Light of Consciousness”—is the deepest core of our being. It is beyond name. Within you is the nucleus from which everything emerges, and that is where Light is. This nucleus of Light has been termed by yogis the antara guha.2 When you merge with That, you become Light—immortal, eternal, infinite, pervading. It not only liberates you, you no longer exist. You are Light. Light merges into Light, from which all other forms are born. When your chakras are awakened and illumined, you will see dazzling Light—beyond words. Even though it is not physical, when that Ultimate Light flashes within you, you will glow. The Upanishad says, Lord, lead us from darkness to Light. That longing for Light is self-extinguishing love, like a moth mad after the flame. Compared to that attraction, charm and beauty, nothing else attracts. For those who are mad after God, it is not only the beauty or radiance that attracts them. They know: This is my True Self. That Light, that love, when you awaken, there are no conditions, no reservations, no back-thoughts, no discussions or trying to convince others. There is a lot of worldly philosophy, but those who are mad after God, who want to see that Light, to be Light, don’t know anything else—Dhiyoyo Naha Prachodayaat: “I shall meditate upon That and nothing else.” It transcends discussions and debates. Any logic or rationality just fades away; you leave those “husks” behind. There, it is just one longing: Let me see the Light, let me be Light. That Light is Immortal Truth, Reality. Everything else is untrue, illusory. ESUS SAID, “I AM WHAT I AM.” The immortal sages of the Vedas, long before, had said, Aham Brahmasmi, “I am Brahman [the Absolute].” Those who believed realized it; those who did not believe did not get it. The sages and lovers of God look crazy and mad to the world, but when people have problems and suffering, they run to their feet and ask for blessings. The ultimate climax is love for the Lord, for the Light, where no considerations are possible; where you cannot be swerved from the path. Such souls know what they are doing. They are alone with their love and longing. Their only occupation is to merge into their True Self. When that Light shines, words are meaningless. It is Ananda Jyoti, Blissful Light. Ananda is the acme of creation. We are children of Bliss. From Bliss we are born. 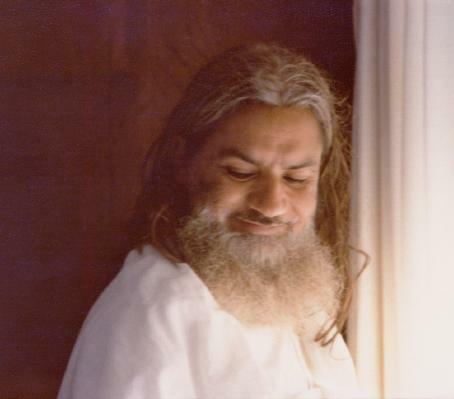 Bliss cannot be verbalized because it is not an emotional feeling, it is inherent joy, Anandam. Rather than manifesting emotion, that Bliss is your established nature. It is indescribable. In the Sanskrit literature, among the highest three attributes of the Absolute—Truth, Consciousness, Bliss—Satchitananda, Anandam is the last manifestation of the three. If Consciousness was just Consciousness, it would be a void. Vedic wisdom does not take the void as a complete last step; it is Consciousness, Reality, Truth. These are not lower than Bliss but the cream is Bliss. That is exactly how God created, out of Anandam, Bliss. From that Bliss God created, not simply because He loved us—that came afterwards. If we did not exist, whom did He love in order to create? God was in bliss and began to dance—He was in ecstasy—and He said, Let Me Be. He did not say, Let Me create. And He became many. After that He loved us, naturally, because we are His selves. We are born out of Him. That is one way of looking at it. But it is not objective, it is one totality. Out of joy He became many. STORY IN KRISHNA’S LIFE ILLUSTRATES THIS: When Krishna was well settled in Dwarka, his golden kingdom on the west coast of Bharat, he had six queens and many children. One day Narada, the celestial minstrel, came to see Krishna’s children. He entered the palace and whichever chamber he visited, every child looked like Krishna. Narada went to Sri Krishna and said, Lord, every one looks like you. Krishna smiled and said, Narada, they are out of Me, they are Me. I am all this. It could not be otherwise. For God and Divine Mother, it is still total. Nothing is lost, nothing is fragmented. Aham Brahmasmi. He has become He—us. When you realize this totality, this link throughout, you will understand that you have lost nothing, you have simply forgotten. After we forget we become ignorant; before that we are Light. The Mundaka Upanishad says, There the sun does not shine, nor the moon, nor the stars, nor does the lightning flash, what to speak of fire! Because of Thy Light all is illumined. With His shining everything shines. By that Light we are living. Although all light is from the Absolute, it is not separate sunlight, moonlight, fire, lightning, and so on; all is from that Ultimate Light. Your body, mind and nervous system have to be purified and strong to sustain the focus. That is why we preach purity and strength, so that your nervous system, flesh, bones, mind and brain are sustained when you concentrate upon your Goal. Otherwise, when you try to focus, the loss of energy through enjoyment, pleasures, gratification or ill-health and other means causes your nervous system to weaken. Then you become imbalanced or react negatively because you cannot sustain the power of that spiritual wealth. This is why we recommend yoga and other methods of purifying and strengthening the body and mind, so that when the Truth and the Light begin to awaken, you have the strength to behold It. For this reason, there are sometimes mental problems on the spiritual path, simply because they do not have the foundation of purity and strength required to hold that higher power. Therefore we teach moderation and virtues such as truthfulness, harmlessness, faith, devotion, and practices such as yoga, control of diet, discrimination in the company you keep and what you speak, etc. These are daily practices to gradually increase your sustaining power. Weirdness, negativity, jealousy, untruth, selfishness, doubt, suspicion—all weaken the system. Those who are negative, weird or selfish cannot focus on one point. Similarly, those who have no control over diet and palate have no control of their limbs and thinking. Without these prerequisites your mind will be distracted and restless. Charity and Karma Yoga (selfless service) are the starting steps for this purification. Then there are the do’s and don’ts: be truthful, harmless, selfless, faithful, devoted, conscientious, non-stealing, non-coveting, non-possessive, and so on. When you imbibe these things your sustaining power—dharana shakti, in Sanskrit—grows. Then when you focus on one point, you have steadiness so that your focus really penetrates. Love and longing for the Light awaken in you. Only with a pure heart can you have longing; with an impure, selfish or jealous heart, you cannot have longing even if you wish to. Longing grows because your heart has no reservations, no back-thoughts, no selfishness, no ax to grind. ITH THAT FOCUS YOU GRADUALLY BECOME IDENTIFIED WITH THE SUPREME. This is what we call Yoga. There is no use in saying: I am Brahman, therefore, why should I do anything? Yes, you are Brahman, but you have not realized it. Rationality does not reach you to Realization. You can justify yourself by words and logic, but still you remain hollow. To make that realization or knowing steady, balance has to be achieved. After your sustaining power is intact, at least relatively, then you can meditate. On what? Just one thing—whatever Goal you choose. That leads you to the final stage, Samadhi, Divine absorption. That final assault is like the moth drawn irresistibly into the light. Light shines, surprisingly and so simply. When that happens, you will say with astonishment, It was always there. It’s so simple, at hand. Why didn’t I get that earlier? Because you were not ready. It takes decades of preparation for you to be sufficiently moral and ethical to meditate. Avoid things that are disturbing, distracting, being untruthful, etc. Then dharana takes a stand; your meditation becomes absorption. Genuine results come with sustained efforts: steady endurance with faith, devotion and loyalty. These virtues may sound obsolete but they still are existent and valuable; lose any of them and you cannot realize. With these age-old virtues your heart becomes purified and your love and longing grow. When you come to this juncture, you are very near your Destination. There are some things that cannot be taught, they come from within you. One is love. Others are peace, joy, freedom, wisdom. When your heart is pure and your concentration is upon your Goal, these inherent qualities awaken in you. That is true love in which you love for no reason, unconditionally. You love the Light because That is your True Self. You love and are compassionate to others because they are your Selves, because God is within everyone. A pure heart automatically loves unconditionally. That is your true nature. WOULD LIKE TO SEE YOU OPEN THE DOOR OF CONSCIOUSNESS and enter into flooded Light. It may sound like imagination but it is a fact: pervadedness. This is not magic, it’s realizable. Light is surrounding us, in us. It’s not there or here. It is everywhere, always. The reason we do not enter that floodgate of Light is because layers of illusion have accumulated in the mind. They have to vanish. When you scatter the clouds of your mind, you will see. Normally we refer to an Enlightened One as an “Embodiment of Light,” but there is a step further: we are Light—made of Light. That is what Is. Light is true Vision: Darshan, Revelation. When you are in that Vision you do not analyze or think; when you think, the Vision is gone. In relativity, dualism, where there is Light, there is no darkness; where there is darkness, there is no Light. The two do not simultaneously exist. There is no coexistence except in relative perception. We talk of two or many but it is a perception or conception only, in order to see form. It is simply the dimensions that light and shade play. In its own brightness and Revelation, Light is One—Jyotirmayee: permeated with Light. When you have that Vision, the question of what will happen to your world and life no longer remain. You know. Creation is all Chinmaya—dazzling bright. The mind wants to deduce and reduce everything to its own understanding, but That is beyond understanding—indescribable. Just imagine: the Light surrounds you, is inside you, you are in it. You have to let yourself go, fall into the Light. Let it envelop you, invoke in you. Light is within you; merge into That. Have faith and trust—unflinching, unconditional. Catch the Feet of the Lord; He will do everything for you. Just feel: Light is surrounding you; Light is in you. Drop into That, without pre-thought or afterthought, and you will feel relaxed in an instant—nimisha maatrena—Sanskrit: “in the wink of an eye.” Reside in your Light. Merge into the Source. The Divine will take care of us. When you realize that Oneness—that everything is God, everything is Light, everything is the same Brahman—then you are the Lord. Ours is to merge, like a drop of water into the ocean. Go with humility, unassumingness and reverence into the chamber of Light and drop into That, delightfully. Edited from Satsangs of Swami Amar Jyoti entitled: Receiving the Light and Merging Into Light. This and other live Satsangs are available on CD and audiocassette.